Spanish luxury brand Loewe will launch 7 Loewe Natural, a new lighter variation on 2010's 7 de Loewe for men. 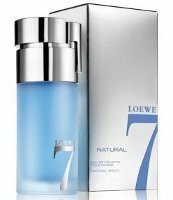 7 Loewe Natural is intended for daytime or summer wear. Like the original, 7 Loewe Natural relies on seven notes. There are six natural notes (bitter orange, yuzu, incense, pink pepper, cedar, vetiver) and one synthetic (musk). Update: 7 Loewe Natural is available in 50 and 100 ml Eau de Toilette.